Hi, I'm Nelson Boren. Thanks for visiting my website. I grew up with an artist mother who knew early on that I needed a space to create. I had my own art shed in the backyard where I was free to explore whatever media struck my fancy at the time. In my late teens I focused almost exclusively on pottery, but continued to sketch and explore different mediums. Deciding to pursue a degree in architecture I found a good marriage between my abilities to draw and create and the technical side of my brain. Practicing architecture for fifteen years I continued to draw and sketch on a daily basis, creating and exploring design, proportion, and green technology. I love being an Architect and as a designer found a great outlet for my love of creating. I saw architecture as a chance to design and build “static/inhabitable art”. Somewhere in the hustle and pressure of managing and owning two architectural firms, I discovered watercolors. In 1990 I sold my architectural firms, bought a small farm in Northern Idaho, loaded the family in our old yellow Suburban and headed north. We dove right into “farm life” and surrounded ourselves with cows, chickens, sheep, two cats and a dog. I remodeled an old tractor barn into an art studio, started painting full time and never looked back. What a great life it has been. After twenty five glorious years on the farm, all our kids moved away and took our grandchildren with them. Since most of our grandchildren lived in Utah, Jeanne and I decided that's where we ought to be. We sold our little farm, and moved to Logan, Utah. It's a great place and we love being close to the family. Here's how my painting "Power Nap in the Barn" started out. My son and two of his friends put on chaps, boots, and spurs and lay down in the back of the old Ford truck. 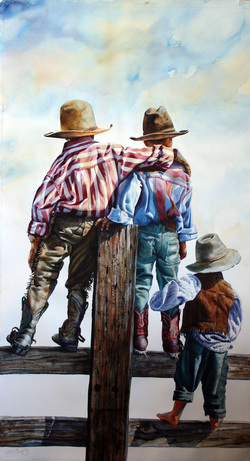 Then, with a dash of artistic license, these became the three napping cowboys in my painting. 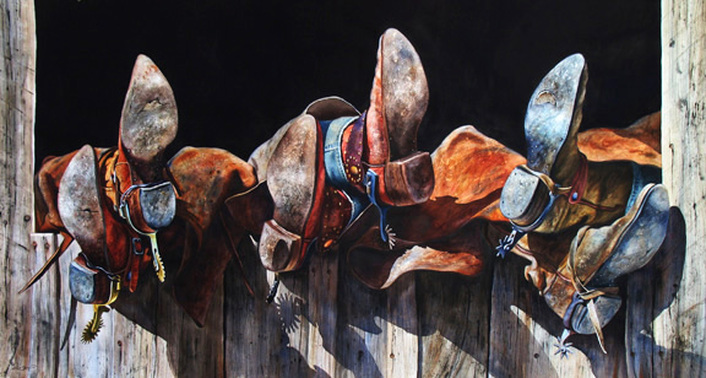 Having worked on a ranch during my teenage years and marrying into a ranching family, I felt a tremendous respect for the men and women that the world calls “cowboys”, and wanted to tell their stories with my paintings. 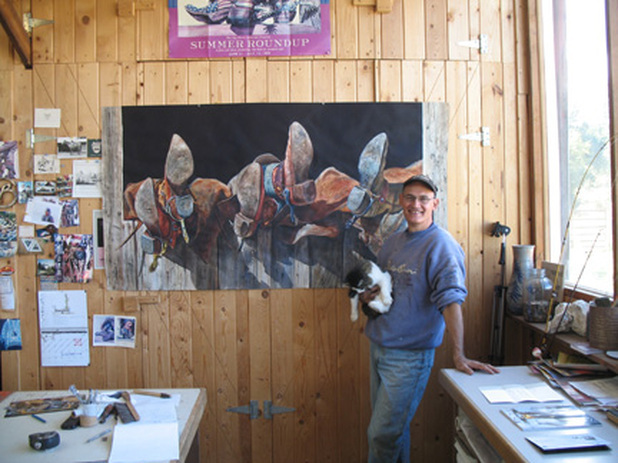 Living on a farm in Northern Idaho with my studio only 30 feet from the house and a full view of Schweitzer Mountain ski resort I am able to compose and paint my "pieces of cowboys,” telling stories of humor, love, family, and work. Recently I began focusing part of my art on my love of fly fishing; I am able to spend more time in the mountains exploring the great beauty of this country - it feeds my soul. Here I am, looking like the consummate fisherman, hard at work in one of my favorite fishing spots. Now, I grab my fly rod and tell Jeanne, “I’m heading to the river to do some art research.” She rolls her eyes and we both know that life is wonderful. My own children have been the models for many of my paintings. Now that they're grown and gone, the grandkids often fill in for them. My greatest love is still for my family. I receive tremendous joy as the next generation of cowboy models (my grandchildren) is learning about the rich heritage that comes from their own ranching background and the men and women that helped make America great. With seven children and 24 grand-kids (so far), there's plenty to go around. Here I am reading to a few of them at our farm. Jeanne snapped this picture while I was making a funny face. Don't look too close. At left, three of my grandsons—David, Nathan, and Isaac—star in a recent painting, "Brother's Love".